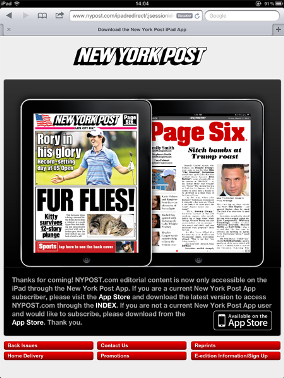 Critics are crying foul over the New York Post's effort to push subscriptions for its iPad app by blocking access to its website via the Safari browser. Visit the newspaper's website from an iPad via Safari and it directs you to download the subscription-based application in order to view the website. The paper's move basically makes its content unavailable to iPad users who do not pay for the New York Post's dedicated iPad app. An iPad landing page now redirects readers to the App Store, instead of an ad on the full website promoting the app, as previously employed. Users of third-party iPad browsers, such as Opera Mini and Skyfire, can still access the Post's website, in what seems to be an oversight on the part of the Rupert Murdoch-owned publisher. The New York Post's tactic to get more iPad users to pay a subscription inside its dedicated iPad app -- $6.99 per month, $39.99 for six months or $79.99 for the year; no single digital issue purchase option -- has flared up critics across the Web who have described the initiative as misguided. PaidContent 's Staci Kramer branded it "one of the most poorly conceived paywall efforts I've come across -- and I've seen more than a few." She notes "for iPad users relying on Safari, it is as though the site exists only as a billboard for an app. It's also broken access from the NYP‘s own Facebook page. Click on a link from within Safari and you end up at the redirect page." Over at Scripting News , Dave Winer says New York Post's strategy to push iPad app subscriptions "is breaking the Web. If no one used the iPad it wouldn't matter. But lots of people use it." He wonders "how Apple feels about this? I can't imagine they like it. I can see the ads now. ‘Get an Android tablet to read the web.'" It's unclear why the New York Post decided on such a platform-specific block for iPad users, without blocking third-party iPad browsers or Android tablets. Part of News Corp, the Post is one of the big titles the company has been trying to monetize by raising pay walls around its websites in order to boost subscriptions. As 9To5Mac 's Seth Weintraub notes, "hopefully the backlash from this move discourages others from copying this game plan."